Please note: the Book of Hours manuscript will be on display Monday to Friday from 9:30 am to 4:30 pm. The accompanying materials are on display whenever the Library is open. 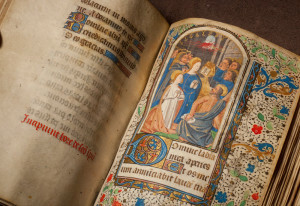 With support from the Gordon Hunter Fund, Portland State University Library Special Collections recently acquired a late 15th century French Book of Hours, the first intact medieval manuscript owned by the Library. The Book of Hours was the most popular text during the late Medieval period. 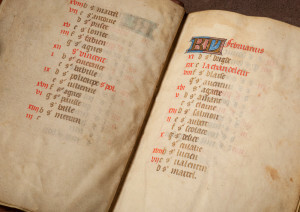 A Book of Hours consisted of prayers and meditations that guided readers through the eight liturgical hours of the day celebrated by medieval Christians in Western Europe. These manuscripts were usually small enough to be carried around and sometimes decorated with colorful miniature paintings and gold leaf. A Book of Hours was an essential companion to a devout reader. Royal and wealthy patrons often owned several, lavishly decorated Books of Hours, but for a family of lesser rank, it was often the only book they owned. 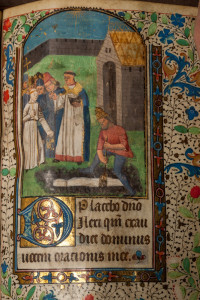 Books of Hours were a compact version of the prayers recited at monasteries. They included calendars highlighting feast days, Gospel prayers, prayers to saints, and most importantly, prayers to the Virgin Mary. The prayers were divided into sections to be read from Matins to Compline with illuminations and decorative flourishes throughout. 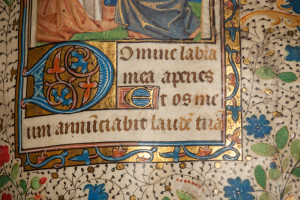 Books of Hours were highly personalized in their original design and later additions to the text made by their owners. Many Books of Hours were given as gifts and remained in families for generations. The Book of Hours presents a wealth of information about daily life and culture in medieval Europe. 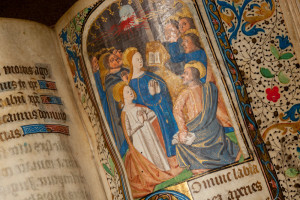 Professor Anne McClanan’s art history seminar in winter 2015 prepared a digital and physical exhibit of the Portland State University Library Book of Hours. The physical exhibit is on display in the Library’s First Floor Exhibit Space from May 4 – July 17. The digital exhibit is available online.